My wonderful friend, Judy, invited my niece and her daughter and me out for lunch on Wednesday. 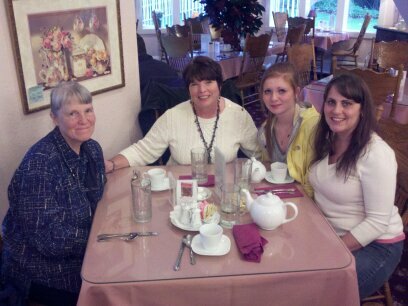 Since my niece lives in Port Orchard, it was the perfect opportunity to experience lunch at the Victorian Rose Tea Room. The restaurant is owned and operated by Debbie Macomber. 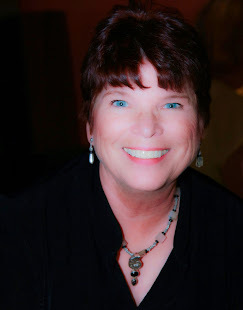 If you don't know who she is before you go to lunch here, you will quickly learn that Debbie is a very popular romance novelist, who happens to live in Port Orchard. She also owns the yarn shop in the next building. I have never read her books, but discovered that she has written over 150 books! THAT'S A LOT OF WRITING!! Anyway, we had a very nice asparagus soup, with salad or sandwich and a slice of pie. And of course TEA! Thank you, Judy! And thanks to Emily and Amber, who is 16, for being available for lunch! Just to add to the confusion, I have two nieces named Emily. This Emily is my brother, Bob's, daughter. Dave's sister, Jill, also has a daughter named Emily. Here is where it really gets interesting. Both Emily's were born at the University of Washington Hospital because they were PREMIES! One was 2 lb. 4 oz. and the other was under 2 lbs. 25 years apart! That's just crazy! !